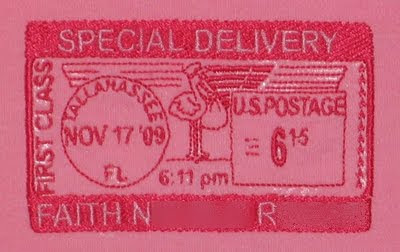 Believe it or not, this is the 400th post on my "Stitched by Janay" blog. CRAZY. 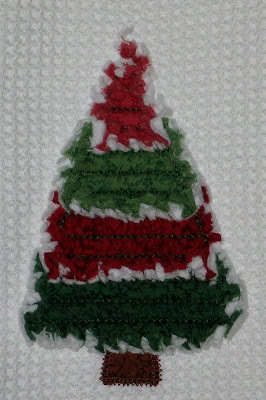 At times I find myself very frustrated that I can't accomplish as much as I want, but when I look back (especially through the Picasa web albums associated with my blog) I am pretty amazed at what all I've stitched in the last two and a half years while being a SAHM of little kids. 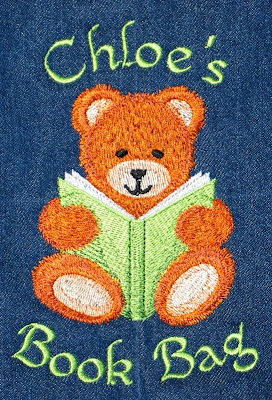 It's been so fun to embroider personalized items, document exactly what I did and share pictures online, initially with just my mom and MIL, but now with all of you who follow my blog. 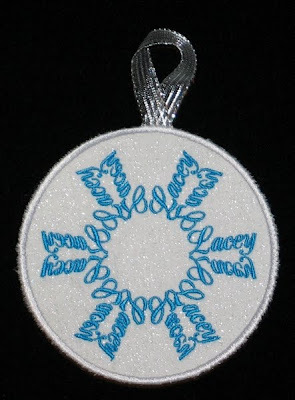 In the last month I have FINALLY joined Facebook, and I've created a fan page for Stitched by Janay -- please come join the fun by becoming a fan. 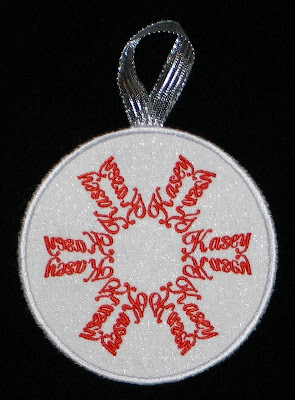 I plan to upload pictures to different albums to make it easier to browse, and as I figure it all out I hope to create an album where you can add pictures of your own Stitched by Janay items in use. 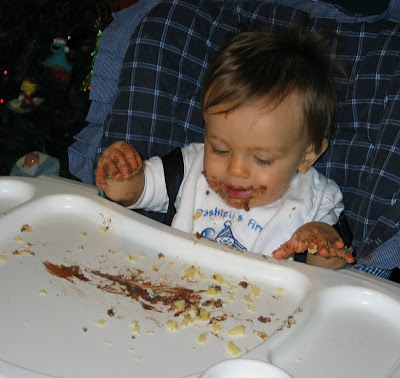 Have no fear -- if you aren't on Facebook and don't want to join, I will continue to update this blog as usual (it will just feed directly into Facebook). Before I sign off on this 400th post, I wanted to share pictures of my new toy! 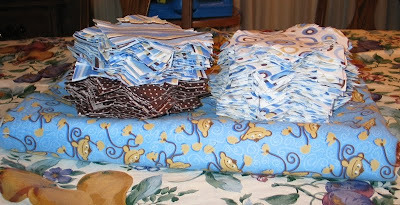 My MIL Kathy gave me an Accuquilt GO! 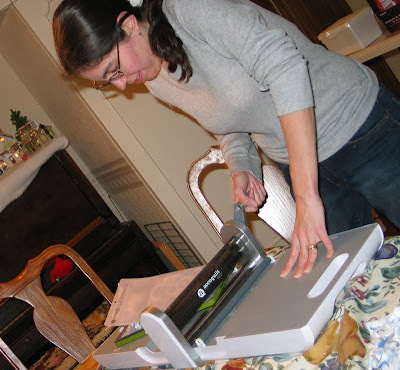 Fabric Cutter along with the rag dies. I am SO EXCITED. 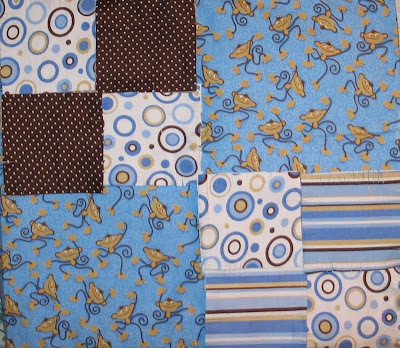 I have already started cutting a rag quilt for Dashiell which I have been putting off for a while. 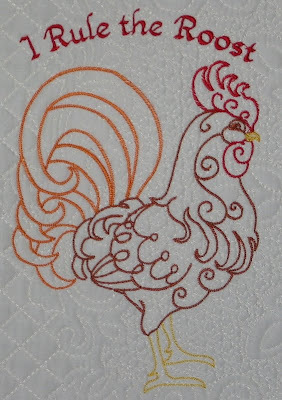 I'm anxious to get it done and enjoy how much time the die cutting process is going to save me -- no more snipping a quilt for hours! 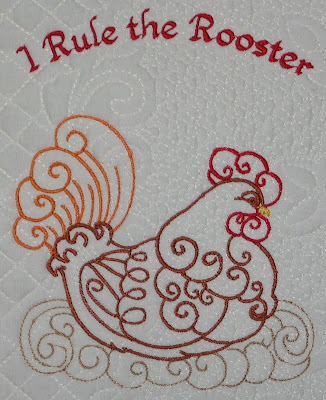 My mom's kitchen is decorated with roosters. I saw these phrases a long time ago and have wanted to do something with them ever since -- this year's Christmas gift was finally the time. 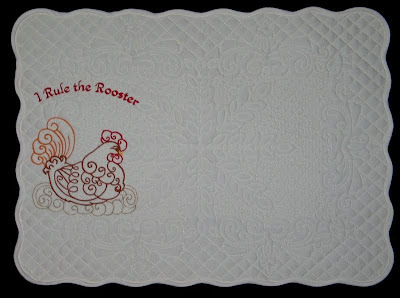 The rooster and hen are from Rease's Realistic Designs set "Raucous RedWork Roosters". 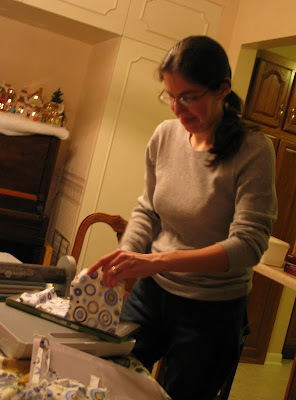 (Join her yahoo group to snag them for free!) 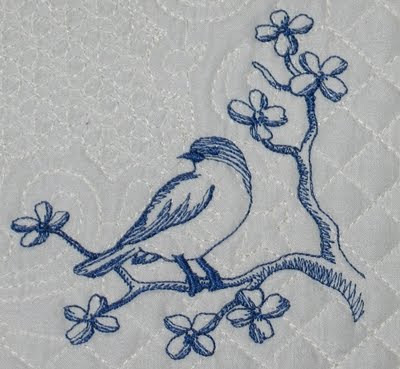 I added the text with Embird Alphabet #33. 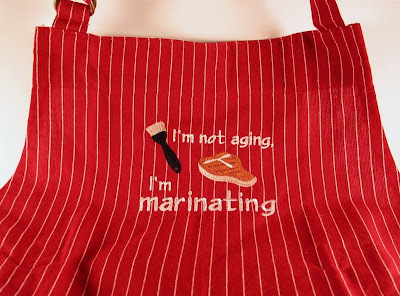 When Susie requested the phrase, "I'm not aging, I'm marinating" on an apron, I knew immediately it would be perfect for my dad! 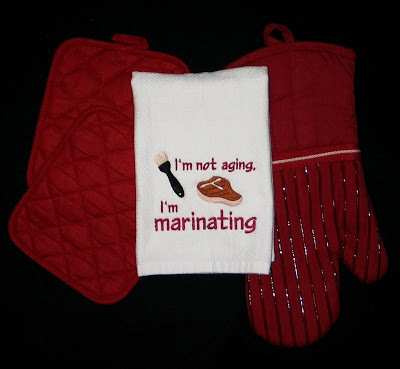 He already has several aprons though, so instead I stitched it on a hand towel and included a new mitt and pair of pot holders for him to use while grilling. 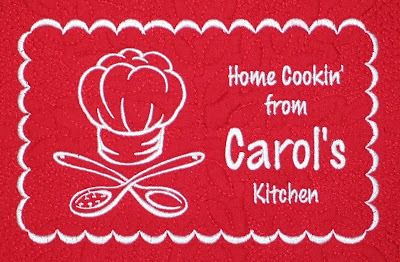 I used Embird Alphabet #14 for the text, and took the basting brush and steak from an Embroidery Library design. 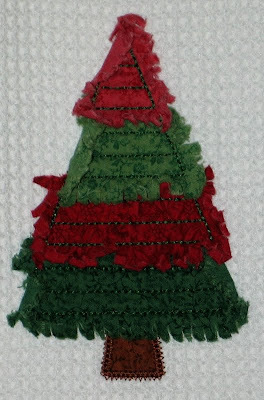 For their Christmas towel, I stitched GG Designs' Rag-It-Up Pieced Christmas Tree Applique design on a waffle weave towel. 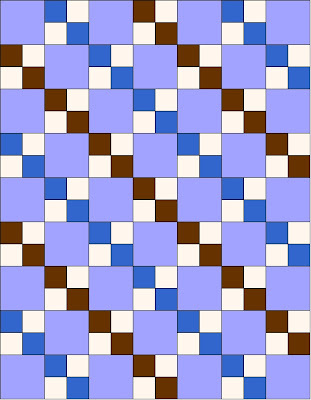 They have been washed/dried once, and will continue to fray the more they are used. They are both pretty. I guess I have to decide what I prefer before doing the next one. 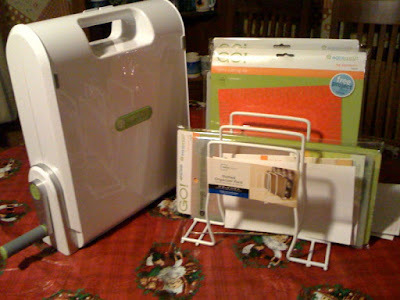 Susie was so pleased with her casserole carrier that she, her mom and sister ordered several to give as Christmas gifts this year. 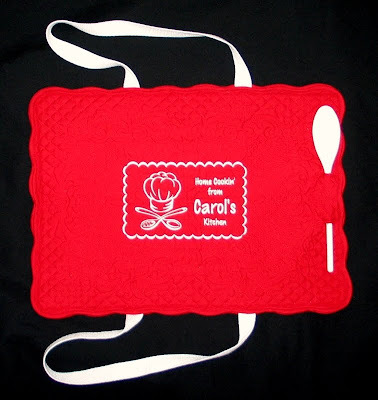 The chef hat and utensils design is from Embroidery Library. 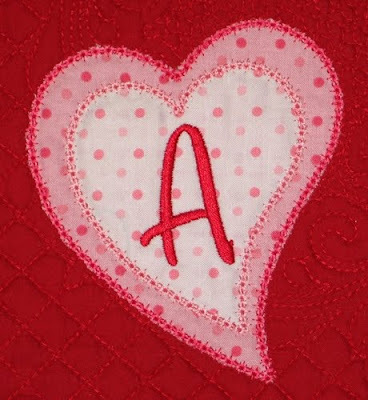 I used Embird Alphabet #8 for the text. 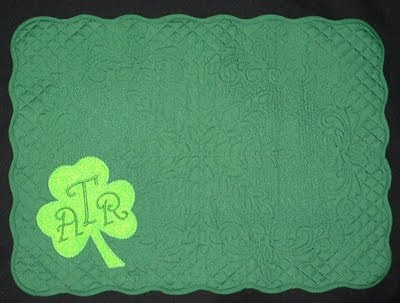 The border design came from Dee Giles. 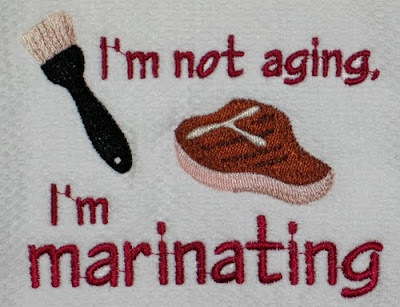 Susie also requested a phrase to stitch on an apron: "I'm not aging, I'm marinating." 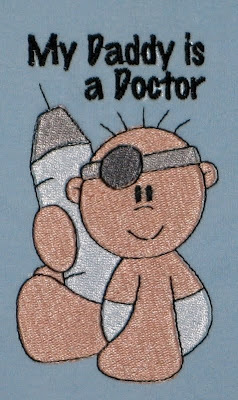 I thought that was so cute! 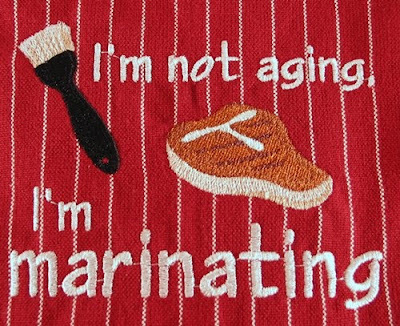 I used Embird Alphabet #14 for the text, and took the basting brush and steak from an Embroidery Library design. 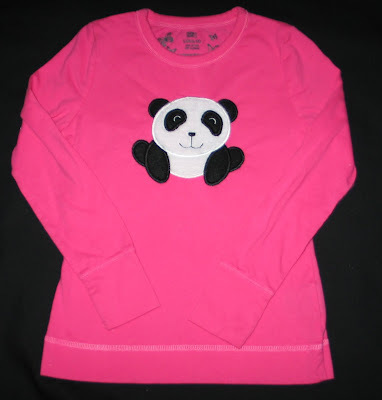 Annaliese's Build-a-Bear is a panda, so earlier in the fall I bought Lynnie Pinnie's panda applique design knowing she would love a panda shirt. I finally got to it in time to give to her as a Christmas gift. 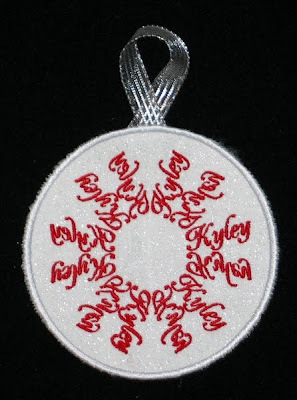 I used white minkee and black felt. 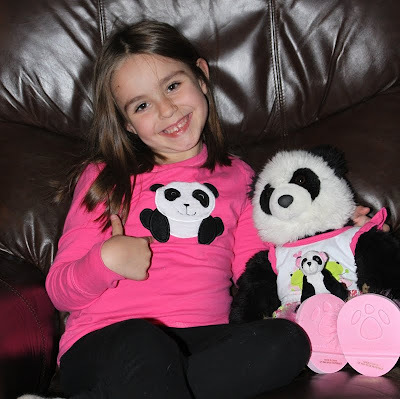 She loved it! 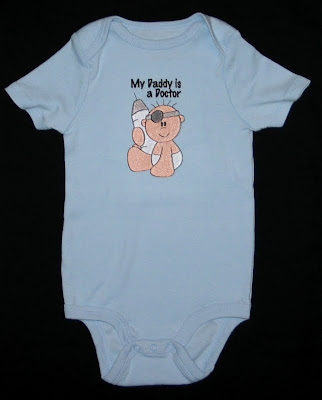 In the midst of Christmas sewing I did have one Special Delivery onesie to stitch (and I have another to do in January). My sister-in-law Amy recently got a new dining room table. 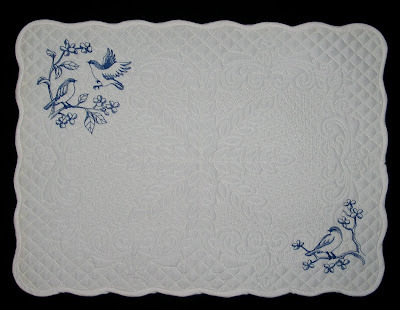 For part of her gift this year I stitched a few placemats. 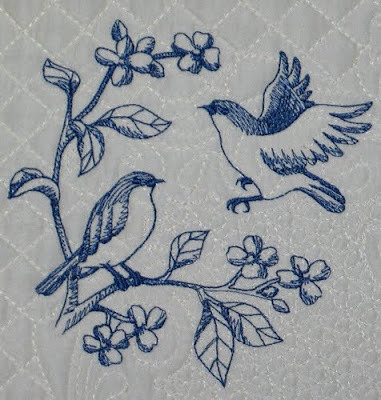 Amy loves bluebirds, so per Kathy's suggestion I used a couple redwork designs from Embroidery Library. 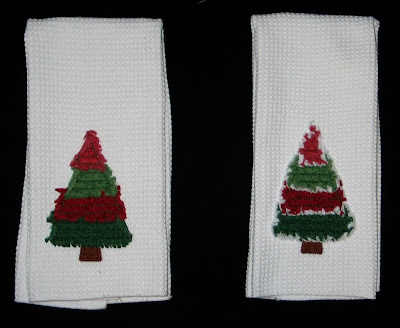 Kathy and I are also going to attempt to create a set of holiday placemats for Amy to use throughout the year. 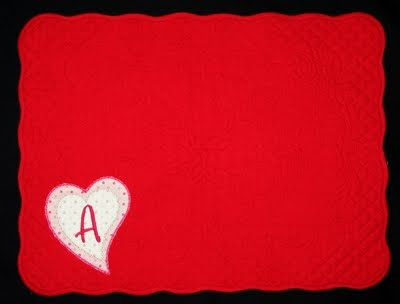 For Valentine's Day I used Five Star Font's Deco Heart Applique Frame and inserted her initial with the Bingham font from 8 Claws and a Paw. 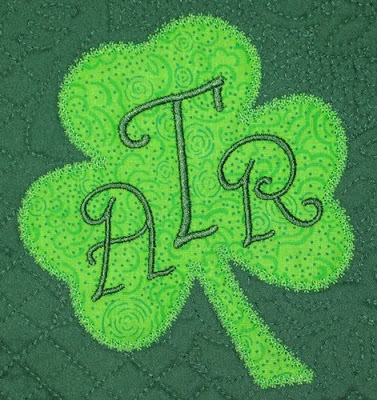 For St. Patrick's Day I used Embroidery Boutique's Shamrock Applique, and inserted her monogram using the Chez font from 8 Paws and a Claw. 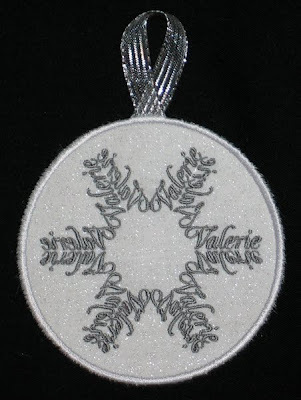 For this year's edition of the nameflakes I used a sparkly white fabric. 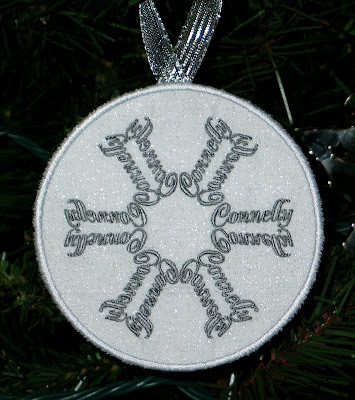 Most of them were made for the Connelly family, plus a couple extras. I used Embird Alphabet #38 for all of them. Michelle also ordered a few other things. 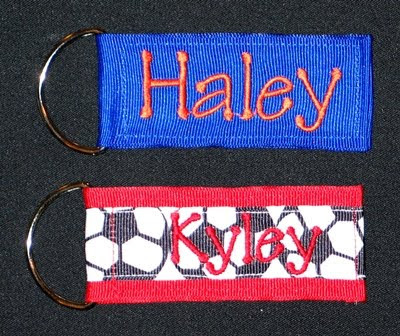 Two of the girls got key chains. I used Tinker Toy from 8 Claws and a Paw for their names. 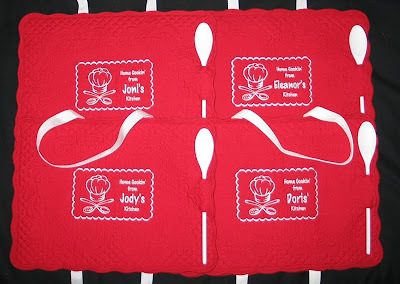 Lacey had asked for this cute apron on her bridal registry, so Michelle bought it and I stitched her name on it using the Frenchie font from 8 Claws and a Paw. Jenn requested a few things to give as Christmas gifts. 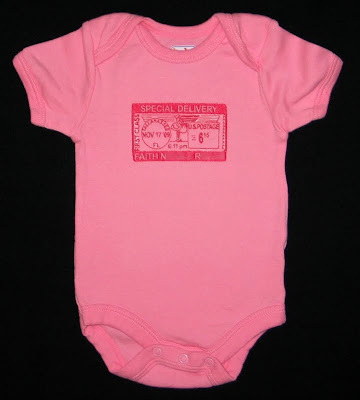 She wanted a onesie for her new nephew that announces to the world his daddy is a doctor! 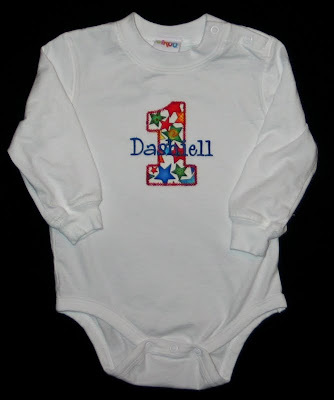 The design is from My Embroidery Nook (it just happened to be the sample design of the occupational babies set, I LOVE it when that happens), and I added the text with Embird Alphabet #8. 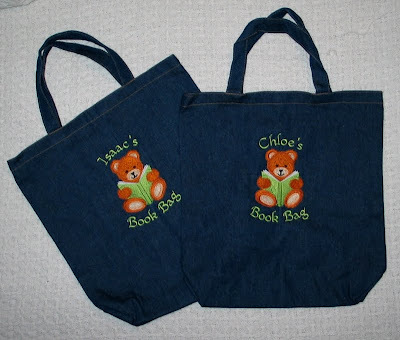 She also wanted tote bags for her nephew and daughter to use at church, just like Annaliese's tote bag. 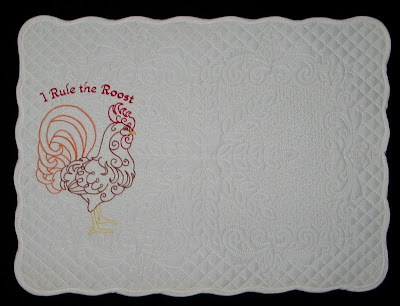 The design is from Embroidery Library, and I added the text with Embird Alphabet #33. 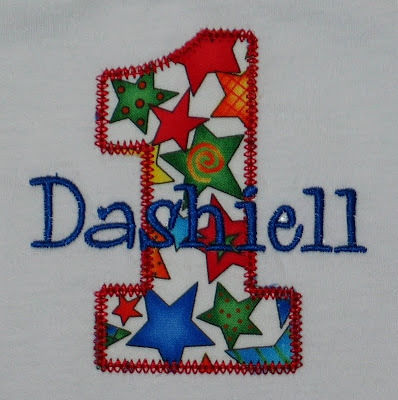 Saturday was Dashiell's first birthday, but in the craziness of the last week, I haven't taken the time to post my stitching projects for the day. 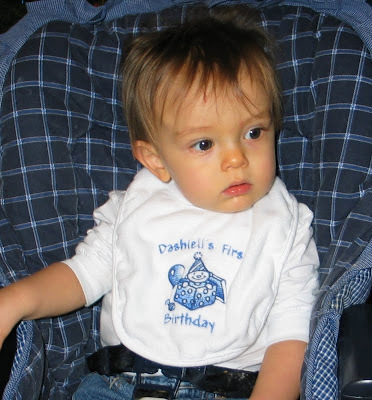 On his shirt I stitched an applique "1" using Chubby Wubby Applique Numbers from GG Designs, and stitched his name across it using the Whoa Nelly font from 8 Claws and a Paw. Here's my big birthday boy, happily playing with a new toy.